Under a leaden sky in oil-rich southern Nigeria, young men hang around with nothing to do, covering their noses from the noxious fumes of the polluted swamp. 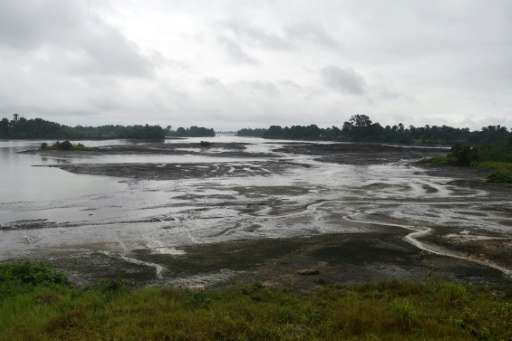 The sight in Bodo, some 40 kilometres (25 miles) southeast of Port Harcourt, is repeated in communities elsewhere in the maze of creeks that criss-cross Ogoniland. One year after the launch of a much-heralded clean-up programme, the oil slicks which blackened the waters, killed the fish and ruined the mangroves remain untouched. Locals, deprived of their livelihoods from fishing and farming, and with the billions of dollars extracted from under them channelled elsewhere, are angry and frustrated. 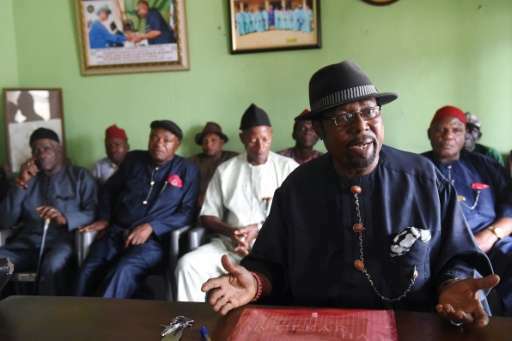 "The progress made on the Ogoni clean-up is known only to the government," said Fegalo Nsuke, from the Movement for the Survival of the Ogoni People pressure group. "The people of Ogoni still cannot have access to safe drinking water, not to talk of electricity, basic schools and roads," he told AFP. In January 2015, there were hopes Ogoniland's luck was changing after Shell agreed to pay £55 million ($70 million, 63 million euros) in compensation to more than 15,500 Bodo people. The Anglo-Dutch energy giant also agreed to start a clean up of two devastating oil spills in 2008, following a three-year British legal battle that was settled out of court. In June 2016, Nigeria's Vice-President Yemi Osinbajo formally launched the project, which the United Nations Environment Programme (UNEP) said could take 30 years. So far, however, only $10 million of the initial $1 billion programme has been released. Since then, a governing council and trust fund have been set up, and a project coordinator appointed, but no equipment has been moved to the sites, residents say. Drinking water is still not fit for human consumption. "The fact is that Ogoni still drinks poisoned water and remains polluted and these cannot be changed by internal processes and media promotions," said Nsuke. "Our people are frustrated," added Livinus Kiebel, chairman of the Bodo council of chiefs. "The environment is completely devastated." 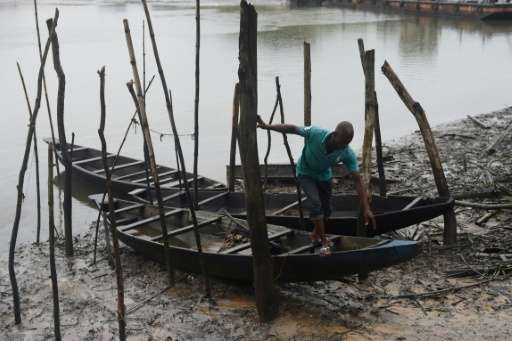 Ignatius Feegha, 41, used to catch fish as a child in the waterways of the Niger Delta. "I used to wake up around 5:00 am with my father to fish and would come back with baskets of fish before going to school," said the civil servant. Today, fishermen are lucky to catch even periwinkles. Standing near a jetty, Buddy Pango holds up a plastic bottle filled with discoloured water as the heavens open and a boat heading to the Bonny Island natural gas plant speeds by. "We can't see no fish in this water because the water is stained with crude oil," he said. "Before we can get some fish, we (must) go to the ocean and it is very far." In places like Ogale, wells and boreholes are contaminated with the carcinogen benzene at levels more than 900 times above the recommended World Health Organization limit. Signs beside boreholes warn residents not to drink the water. "Every week, at least five people die because of cancer and respiratory diseases," said community leader Dandyson Nwawala. 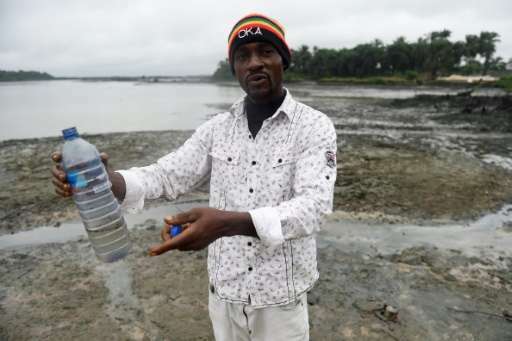 Roman Catholic priest Father Abel Agbulu, who has been mediating between Shell's Nigerian subsidiary and Bodo locals, said the clean-up could have started earlier but for opposition from some youths. He said the youths who were unemployed insisted on being paid the money instead of allowing Shell to give the job to contractors. "The youths said they wanted money instead. So Shell, which had already engaged two companies to do the job, had to back out," he added. Agbulu said Shell was not ready to give cash to the youths and since they would not allow the contractors to handle the job, decided to suspend the clean-up. The head of the government-appointed Hydrocarbon Pollution Remediation Project (HYPREP), Marvin Dekil, said training local workers in the required skills is taking time. "We don't want... to rush it and get it done in a wrong way," he explained. In the meantime, some locals have taken matters into their own hands and begun planting trees to try to restore the damaged mangroves. The United Nations Development Programme's representative in Nigeria, Edward Kallon, visited Ogoniland last week and called for patience. "This is a very technical investment, it is not a rural type of investment where you are going to see houses built within a short period of time," he said. How long they will have to wait is anyone's guess.